Oops! AppLock: Security is one of the major concern now a days. Our daily gadget, Smartphone has various types of content such as private photos, private chats, private applications. To hide our private content we need some external applications to do it. 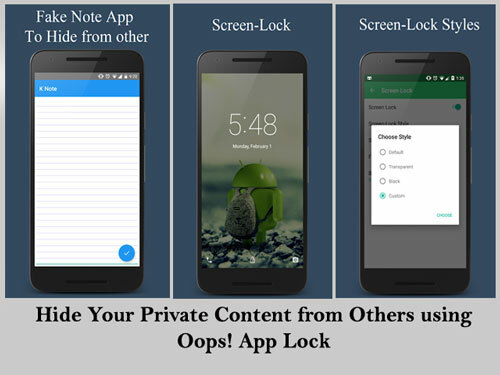 Here in this post, I will list out the best android app lock application Oops! 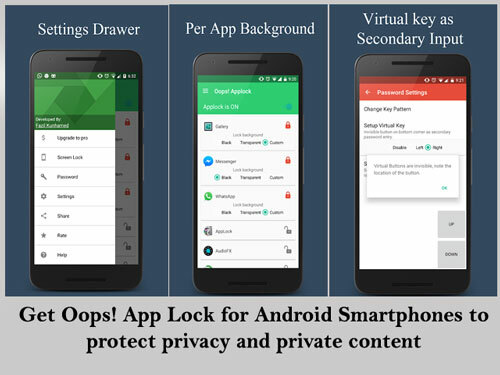 AppLock features usage and advantages. The major advantage of this app over other security lock apps is you cannot find the application exact name on the device using this app. So for strangers who are intended to see your private content cannot trace the app as it is visible with name K Note. Oops! application locker does not use any on-screen password ie. pin based or a pattern based locking system. We use volume key pattern as the password. You can make any pattern using volume keys, like UP UP DOWN UP. Oops Applock is Totally invisible. Oops Applock ScreenLock is safest screen lock. Using Oops Applock ScreenLock nobody can unlock your phone. Using Oops Applock ScreenLock nobody even notice the phone is locked. Oops Applock ScreenLock has different styles to choose. Oops Applock is the Most secure way to lock apps. Nobody even notices your app is locked with Oops Applock. Oops Applock can lock any applications, It is Simple and Fun to use. You can set different background for lock screen on every locked App. Transparent and Black background makes as if your application is stuck. Fool friends with custom backgrounds. This is all about Oops! AppLock and K Note App Lock. The major advantage of this app i.e. It will save on smartphone with other name so no one cannot find that your app lock. If you have any other important point added to our content do let us know through comments. Do share your feedback about the app in comments and help other readers.